I must confess, I knew very little regarding F. Scott Fitzgerald prior to my watching of the new Amazon original series Z: The Beginning of Everything, beyond reading The Great Gatsby and knowing the names of a few of his other classic works of course. 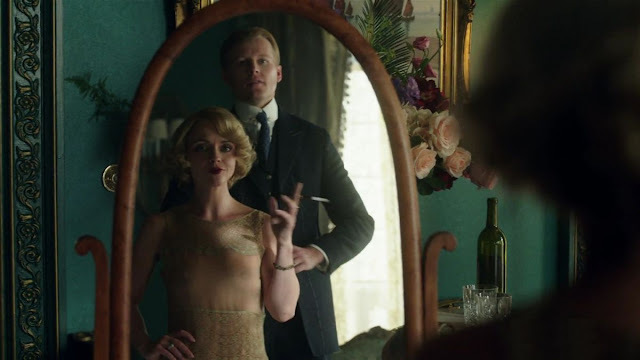 I knew even less about his wife, Zelda Fitzgerald, formerly Zelda Sayre, so I can't give you a breakdown of whether or not the events that happen on screen were authentic in any way to their factual story together. All I can do is critique what I saw. I had some pretty severe doubts about whether this show could keep me engaged after a few episodes because it just didn't seem to have much meat on its narrative bones, but that brings me to the first thing I did appreciate greatly about the series. Thank goodness creators Tim Blake Nelson, Nicole Yorkin and Dawn Prestwich understood that the material they were working with was better suited to shorter episodes, with each of the ten being a half hour or less. It feels like dramatic televised storytelling is constantly being stretched out to nearly an hour per episode whether the writing is worthwhile for that much time or not, and the easiest way to lose an audience is boredom. Z: The Beginning of Everything is never boring and while it isn't perfect, it certainly is well made and the farther you dig into the ten episode run, the more you are likely to appreciate stuff like the set pieces, costumes and the performances, all of which effectively transport the viewers back to the era it takes place in, which begins in 1920 when a beautiful small town girl named Zelda (Christina Ricci) falls in love with a soldier and aspiring author named F. Scott Fitzgerald (David Hoflin). The presence of a supporting player like David Strathairn playing Zelda's father help give the show an extra shot of legitimacy and integrity, as he is an accomplished and outstanding actor. One thing that does bring the show down though is a feeling of redundancy, that we are watching the same two people travel down the same road over and over throughout the ten episodes as we are witnessing the painful struggles of their marriage, and despite some solid character work in the show as a whole, I am not sure that I cared enough about either of them individually or especially their lives together to really be invested in their marital ups and downs. The best moments of the show happen later in the season when they experience a change of pace and move from the glitzy and glamorous city life to a gorgeous beach side home they purchase to escape from the hustle and bustle, with some tremendous camera work and breathtaking scenery working to make this show a soothing, easy watch. It's a good show, and after doing a bit of reading on their history together, I hope a second season is granted by Amazon because there is a lot of material to explore. Based on the way the first season ends, I would hope and expect to see more streaming on Amazon Prime at some point.